In this Sierra Designs Meteor 2 Tent Review you can read about a completely new 2017 tent launched just a few weeks ago, a reliable freestanding camping tool. See more below. 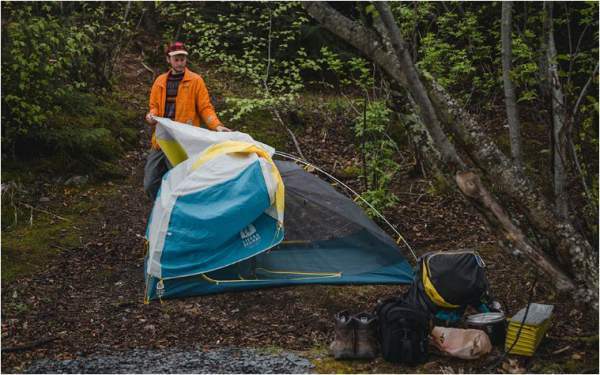 Sierra Designs Meteor 2 Tent: 2-Person 3-Season. Pre-bent poles for extra volume. The Sierra Designs Meteor 2 Tent is a completely new tent launched in Fall 2017. So please do not mix it with the Sierra Designs Meteor Light 2 tent which has been on the market for a long time, and it has a completely different design. 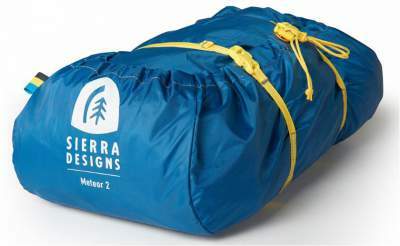 Note also that there exists (perhaps discontinued now) the Sierra Designs Mountain Meteor 2 tent, which is again a completely different model. So if you see any older review, you will know this is not about the Meteor 2 tent; this tent is new, from September 2017. The inner tent body is all mesh. The roll-up style fly for stargazing. The Meteor 2 is a freestanding tent in full sense, see the picture above. 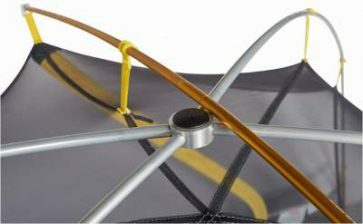 There are two main poles which create a stable X-shape structure, and they connect with the tent base through the grommets in the corners. As such, it can be pitched on any terrain, so this is a good feature. But you will stake it down whenever possible, and they provide 6 guylines and 10 stakes, all is in the package. 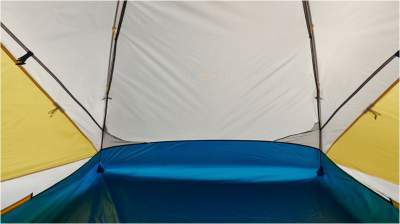 The tent is also 3-season type, so for moderate conditions, with the typical 2-layer construction which includes the inner tent and the fly, you can see this in the picture below. The new 2017 Metro 2 is freestanding, 2-layer type tent. This tent has a floor area of 29.8 square feet (2.77 square meters), so it is big enough for two adult campers. Note that you also have two vestibule areas 9 + 9 square feet (0.84 + 0.84 square meters). So this is quite a space for you and for your gear. Now, the packaged weight is 4 lb 8 oz (2.04 kg). Although they speak about the minimum weight of 3 lb 15 oz (1.78 kg), I would not count on that, the real weight is the packed weight. So you realize this is not so lightweight tool even if its elements are shared between the two users. So I would say this is a camping tool to be used at places at a car or motorbike access, or for cyclists, kayakers, hunters. It can be good also for overnight or weekend short hiking and mountaineering tours. If you need something for backpacking, you should have a look in my another text. The back view with the fly on, see the vestibules. 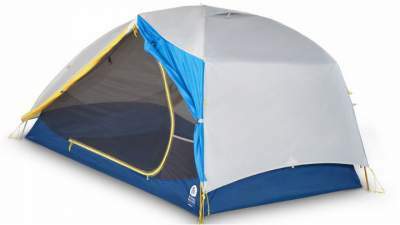 This is a very comfortable tent with two very large side doors. It is with pre-bent poles at both ends of the tent, so this creates a lot of extra volume. There is a ridge pole as well, shown in the picture below, which lifts the side walls and makes them nearly vertical, increasing the volume inside. So although the floor area with 2.77 square meters is quite a normal size, the feeling of the space is far better than you would expect. But note its dimensions, 84 x 51 inches (213 x 130 cm). So the length is very good but the width is such that only 2 pads up to 60 cm width can fit there. The fly is the full-coverage type, with a vent and with two vestibules (see the picture above) which create a lot of extra covered space for gear. Note that the fly can be rolled up for stargazing at clear nights. Everything is color-coded so the setup is really easy. There are mesh pockets inside for each of the occupants. There are two main poles and one ridge pole. You have quite a durable stuff here. So both the fly and the floor are 68D 190T poly taffeta, PU WR FR CPAI84. 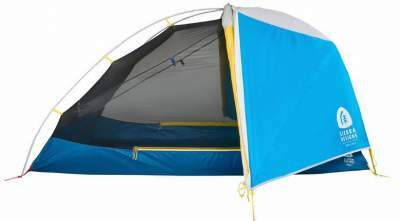 The tent body is completely 15D nylon No-See-Um mesh. The poles are quality DAC press-fit aluminum. As for the notation, here FR CPAI84 means Fire Retardant by the standards of CPAI (Canvas Products Association International). The DAC means Dongah Aluminum Corporation, a well-known pole manufacturer. This tent will give you a full protection. You have 1800 mm waterproofness rating both in the fly and in the floor, more than you will ever need. All seams are taped. If this is for any activity where you would not carry it in the backpack, this is a great solo tent as well, and you can use it in combination with some cot. Almost every cot on the market will fit there, just do not go for very tall cots. See many of them described here. In such a combination you will have plenty of space around, even for a dog, and under the cot. They have a specially designed footprint for this series. So they do not force you to buy it together with the tent, and this is something I appreciate. You can order it here, the price is around $27. Please read here a bit more about footprints in general. I already pointed out the weight, and you will be able to compare it with some other tents below. The price at the moment of writing the text is around $249, so this is very reasonable. Please follow the links for updates. Best use: camping, hiking, mountaineering. Minimum weight: 3 lb 15 oz (1.78 kg). Packaged weight: 4 lb 8 oz (2.04 kg). Packed size (L x D): 18 x 6.5 in (45.7 x 16.5 cm). Floor area: 29.8 ft² (2.77 m²). Vestibule area: 9 + 9 ft² (0.84 + 0.84 m²). Dimensions (L x W): 84 x 51 in (213 x 130 cm). Peak height: 41 in (104 cm). Poles: 2, DAC press-fit aluminum. Fly: 68D 190T Poly Taffeta, 1800 mm PU WR FR CPAI84. Floor: 68D 190T Poly Taffeta 1800 mm PU WR FR CPAI84. Body: 15D Nylon No-See-Um mesh. Steep wall for extra volume. Fast & easy two pole setup. See how the Meteor 2 compares with these two top-notch tents from renown brands. To see more please follow the links. As you realize, the numbers for the Meteor 2 tent looks really good. Now see the prices at the moment of writing this text: $249, 200, and 400. So its price is indeed very reasonable for what it offers and for its quality. In the conclusion of this Sierra Designs Meteor 2 Tent Review to stress again that this is a really nicely built and reliable tent with a very reasonable price, and from a brand which I trust, so I can fully recommend it to anybody. I have included this tent in my list of best lightweight 2 person backpacking tents. But if you need something different from the same brand, check this newly redesigned Sierra Designs Clip Flashlight 2, and Sierra Designs Sweet Suite 2, and much more in my page about tents. 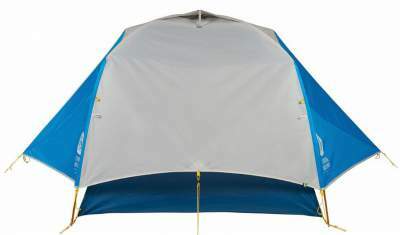 If you need a solo tent from this brand, see this Light Year 1 tent. Note that they have the Meteor 3 tent in the same series. Need something more in the basecamp-style? Check this Vango Omega 250 with two separate rooms. Thank you for reading. I love to hear from you, so what do you think about this tent, any thoughts? Please use the comment box below in the case of any comment or question. I wish you a nice day.